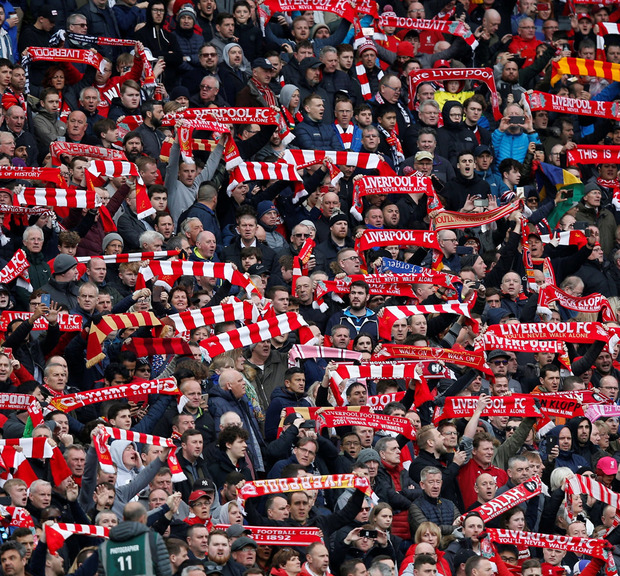 When the anxiety lifts from Anfield, supporters bounce and yell and shake the stadium. There is no fear in football like Liverpool's dread of another revival going wrong. When the dream flares back to life, the racket in this ground rattles your bones. Sometimes in a title race you need a little help from your friends. Or your enemies. And Spurs came bearing gifts in a second half they mostly dominated but also gave away, with two amateur errors which restored Liverpool's lead at the top of the Premier League. Winning easily and stylishly is the preferred option but sometimes scraped victories carry a special pleasure. They prove the team's ability to 'grind out' wins and show providence to be on their side. We all love a turning point - a celestial sign. Steven Gerrard's disastrous slip here against Chelsea was one incident easily identifiable as the day the world changed. But we only really know at the end. So judgment must be withheld on Moussa Sissoko's abysmal smash high over Alisson Becker's crossbar, and on Hugo Lloris' weak parry of a Mohamed Salah header, which led to the ball bouncing in off Toby Alderweireld's shin. Those Tottenham mishaps made the locals happy and shifted the pressure back to Manchester City, who are two points behind with a game in hand. Spurs going home is a blessing for them, because they are currently terrible away. They have lost six of their past seven fixtures on the road, though 33 away points remains respectable. Not starting with Son Heung-min after his international exertions was an impediment, and he transformed Tottenham's play after replacing Davinson Sanchez. They were level two minutes later through Lucas Moura but then blew their chance to enter the magnificent new Tottenham Hotspur Stadium as conquerors of Jurgen Klopp's Liverpool. For Mauricio Pochettino's men, a fight for the crown has now descended into a struggle for a top-four place. Their architectural masterpiece should inspire them for the years ahead, but for now they have Manchester United, Arsenal and Chelsea to deal with in the 'race' for fourth. Outshining Liverpool in the second half turned out to be a hollow gain as Sissoko and Lloris handed over the points. The angst gripping the red half of Merseyside has been a constant feature of this season, and an amusement for fans of rival clubs. Some in Liverpool's flock see every high as an open door to the next low. They see threats everywhere. They have been here before, of course, under Gerard Houllier, Rafa Benitez and Brendan Rodgers. They are experts in hard landings. The players must detect this pessimism. But they show no signs of wanting to take their script from history. "I think we wanted it more than them, and we showed that at the end," said Trent Alexander-Arnold, who provides a formidable full-back partnership with Andrew Robertson, who again excelled. Liverpool's spirit and work ethic is one of their best defences against those who will mock them if City end up champions again. Liverpool's 'bottle' is not in doubt. If they fall short this year to extend a 29-year wait for the title, it will not be through lack of character. But it helps when your visitors conspire against themselves. Liverpool are unbeaten in 37 league home games, which matches City's run in 2010-12 (Chelsea went 86 games without losing at home from 2004-08). Spurs were well placed to break the Anfield spell when Sissoko broke through, with Son on his right and Virgil van Dijk the only defender back. But Van Dijk cleverly blocked off the pass to Son, inviting the weaker of the two attackers to shoot. Sissoko summoned zero composure, blasting the ball high and falling face down before Son picked him up and urged him to continue. When Alderweireld inadvertently shinned the ball into his own net in the 90th minute, Sissoko bowed his head and planted his hands on his knees. Guilt is a terrible thing. Lloris, though, committed the more costly error, weakly pushing away a fairly tame header. Anfield had grown quiet after Moura's equaliser but now pandemonium broke out. There are only six opponents left: Southampton, Chelsea, Cardiff, Huddersfield, Newcastle and Wolves - though they need City to slip up. The champions do face distractions: an FA Cup semi-final against Brighton on Saturday, and an all-English Champions League quarter-final against Spurs. While Tottenham look to architectural grandeur to lift them, Liverpool have a rota of players who can chip in when things are going badly: a cabinet of the willing, with Van Dijk holding it all together, and the front three taking turns to shine. Chris Bascombe The image circulating ahead of the Champions League quarter-final was of Mohamed Salah on the cover of 'Time' magazine. Maybe this year it is for Liverpool.